478 - The Ansi 4 7/8" faceplate for wood, metal, or aluminum. 478 Faceplate: 1/8� Horizontal adjustment feature. For new or replacement installation in wood, metal or aluminum frames. 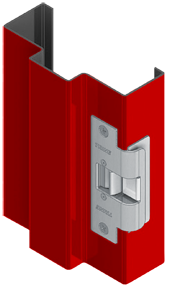 Use with cylindrical locksets having up to 5/8� throw, based on 1/8� door gap. 60% LESS CUTTING of Frame Face for ANSI 4 7/8� pre-prep frames. This faceplate as been upgraded with a 1/8� Horizontal adjustment feature. Stainless plate designed to fill in the hole left by competitor models.